We’ve all been there. That moment when it seems everyone else has abandoned you. You’re on your own and not sure you’re up to the challenge. My moment came in the middle of a pasture; with a cold rain falling and darkness all around. What do you do in that moment? I prayed. As much as we plan, as prepared as we think we are, things happen in our lives that remind us we are not in control. On December 30th, I helped a first-time heifer deliver her calf. We never plan it this way. In fact, we always expect calves born in our clean, dry barns on bright clear days. Ah, reality strikes again. I kept a close watch on “Ms. Lynn” for days. This was the last of my heifers to calve this year. First-time births can be troublesome as the mama cows have never delivered before; so the labor and birthing experience is new to them. 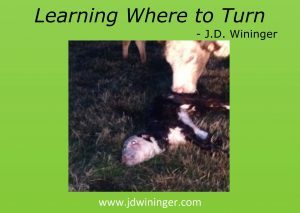 Many factors play a role in calf development. Genetics of both sire and dam, feed intake the last few months of gestation, and nature itself all combine to determine the size and health of a calf. An adage is big cows have big calves. I’ve learned this is not always true. In “Ms. Lynn’s” case, the heaviest cow in my small herd, it proved true beyond any doubt. The average weight of calves born before December 30th was seventy pounds. Her calf was an overachiever. Weighing in at nearly one hundred pounds, it is easy to see why this delivery was such a problem. Once I determined the need to pull this calf, I phoned my veterinarian. He was on another farm call and unable to come. I’ve learned a great deal about farming and ranching since starting the Cross-Dubya in 2013. What I continue learning is where to place my trust. Among my favorite scripture verses, those I hold dear in my heart, the words of King Solomon in Proverbs 3:5-6 ring true. “Trust in the Lord with all your heart, and lean not on your own understanding; in all your ways acknowledge Him, and He shall direct your paths.” (NKJV). I have many bad traits and habits in my life. Chief among them, I all too often attempt to do things myself, in my power. God, in His wisdom, is a master at humbling us as He works to mold us and make us useful for His kingdom. I’m certain I am one of His most challenging children. When it came time to act, I uttered a prayer. “God, I need your help to get through this. I’m not sure what I’m doing here, but I need to save this calf and mama.” Next, I sent a text to my friend “Am pulling this calf alone here. Say a prayer buddy.” What I never stopped to realize is how I was not alone. I was not abandoned. It was never a case of me against the world. For three hours, I sat in the cold, rain, and mud trying to help deliver the calf. With every pull, every attempt, I cried out to God. I begged, pleaded, and yelled at God to help me; reminding Him of His word and His promises. With a final pull, I delivered the calf. Soon, the twelve hundred pound mama was standing over her calf, giving it her full attention. As I removed the birthing chain and backed away to safety, I knelt and raised my hands to praise God for His faithfulness. I pray you learn this lesson of faith much easier than I did. This world, our strength, and our health always fail us; God’s promises never will. Turn to Him faster; pray to Him with great fervor. Love it J.D.! I understand your prayers because I have been through this with my goats, just not in the rain and mud…God always provides! I’m sure He must wonder why we take so long to ask for help or why we think we are alone! Thank you for the reminder. You bet our God provides Ms. Stephanie. Didn’t know y’all had goats. They can certainly be a handful too. I love how God guides me to so many knowledgeable friends who help me to learn things. Although, I’m pretty certain the folks at the local farmer’s cooperative got a chuckle out of watching the manager use my arm as a calf’s leg to teach me how to apply birthing chains. God’s blessings young lady. J. D., what a beautiful story! Loved picturing this poignant moment, the relief, and the miracle. Yes ma’am. Perhaps one day I can share a photo or video of “Homer” today. He’s about 120 lbs. and is running all over the place; chasing and “high-tailing” it with the other calves. He eats hay and corn already at only a month old. God’s blessings ma’am. Hi J. D. Glad calf and Ms. Lynn are doing ok. It is true, we pray like it’s our last resort when it should be our first response. The Scripture you used, Provide 3:5-6 has been on my heart for days. God is speaking to me, and your post confirms it. Trusting and acknowledging Him, our part, directing our paths, His part. He knows the best steps to take. Thank you. We serve a good God Ms. Carla. Thank you so much for your encouragement to keep writing ma’am. We never know sometimes who are words are meant to help, but I believe God knows before we ever sit down to write them. Wow, I just can’t even begin to imagine! Must’ve felt like way more than three hours! Yes, it’s crazy how we humans turn to prayer as a “last resort” – all the while knowing that it should be our FIRST priority!! Bless you for sharing this post! Sometimes it seemed like an eternity Ms. Julie. Especially when the little calf wasn’t breathing after birth. I loved how God showed me every prayer is important ma’am. Even ones for a little calf and his mama. God’s blessings ma’am. So glad the “little” calf made it. I’ve been through a couple foaling mornings when the foal didn’t. Sad for the mom as well. God is faithful. Even while running the universe, He “stoops” to answer a humble rancher’s rantings and pleas. He cares. He loves. Thanks for the story. Was on the edge of my seat for a while. Hope you got an afternoon nap that day!! It does hurt when we lose one doesn’t it Ms. Jackie. I lost a bull calf (born deformed) just a couple of weeks earlier. It breaks your heart when you hear the mama bawling for her calf, knowing no one will answer her cries. I have to give this little fella every opportunity. Remind me to tell you about the need for nitro right in the middle of all this one day. LOL! We serve a mighty God ma’am. Thank you so much for your comments. What an excellent read. I was on the edge of my sofa under a fleece blanket waiting for the next move. All along, I kept thinking of the parallel of my struggles. Thanks for sharing. Yes, if only we uttered “I trust you,” it wouldn’t feel so alone..
As I’ve learned to say here in Texas Ms. Karen, “I’m tryin’ to tell ya!” Sometimes I’m amazed at what a patient God we serve ma’am. I’m certain I can feel Him lower His glorious head, smiling as He shakes His head side-to-side, and chuckling softly as He says “My child, we’ll try learning this lesson again. Let me help you to trust in me.” I am hoping this lesson sticks with me for whatever years I have left my friend… lean not on my own understanding, but depend on the promises of God. Thanks so much for bring a smile to my face this morning. It’s always nice to learn we’re not alone in this journey. Well, I can see God calling me a knucklehead on numerous occasions! But, I agree, that He was right there with you. Those animals continue to teach us the most awesome lessons, (although I’ve never pulled a calf). That “trust in the Lord” message just hits the nail on the head, doesn’t it? Glad Mama and Baby (and you) survived the birthing. I certainly agree Ms. Katherine. I am coming to learn to rely on Him more and more with each passing year. Now, if I can just remember to release myself to Him faster next time. God’s blessings ma’am.